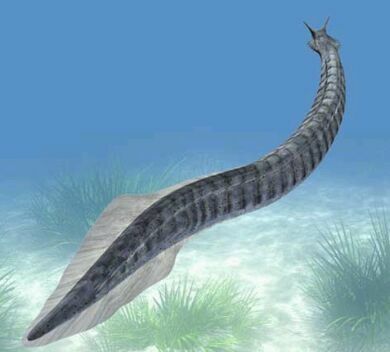 Pikaia gracilens, a two-inch-long worm-like sea creature, is the earliest-known animal to have the beginnings of a backbone, according to Cambridge University scientists. This makes Pikaia gracilens, which evolved more than 500 million years ago, a precursor of modern vertebrates, including humans. The latest study resolves a debate about whether it is the first member of the chordate family. Chordates are distinguished by having a “notocord” – a flexible rod supporting the nerve running down their back- which, over millions of years, would become the spine in their more advanced descendants. On both sides of Pikaia’s notocord in a neat zig-zag pattern are around 100 tiny blocks of muscle tissue – called myomeres – which are thought to have allowed it to propel itself quickly through the water by bending its body from side-to-side. Pikaia had no eyes or teeth but has a clearly defined head, gills to take in oxygen, and two tiny tentacles which may have had some sensory ability to find chemicals to feed on in the water. Simon Conway, a Cambridge University professor, who led the study, said: “The discovery of myomeres is the smoking gun that we have long been seeking. “Now with myomeres, a nerve cord, a notocord and a vascular (blood vessel) system all identified, this study clearly places Pikaia as the planet’s most primitive chordate. The researchers, whose study is published this week in the journal Biological Reviews, analyzed 114 specimens found in the Burgess Shale in Canada’s Rocky Mountains, one of the world’s most celebrated fossil fields with specimens dating back 505million years. They used a range of new imagery techniques such as scanning electron microscopes, to reveal finer details in the Pikaia fossils. It is not clear why Pikaia began to develop a backbone but it may have needed to escape more quickly from predators. Dr. Jean-Bernard Caron, from the University of Toronto in Canada, who took part in the research, said: “Fossils of primitive chordates are incredibly rare. “Pikaia would stand no chance of preservation in normal conditions outside exceptional sites like the Burgess Shale.